I buy today the template: RND Kascetic. The installation runs correctly without error but the product does not appear in the selection of kunema templates, yet the files have been successfully installed on the server. 1 year 10 months ago	- 1 year 10 months ago	#500 by Eugene S.
Current templates are designed for Kunena 4 version only and each template have a warning message. 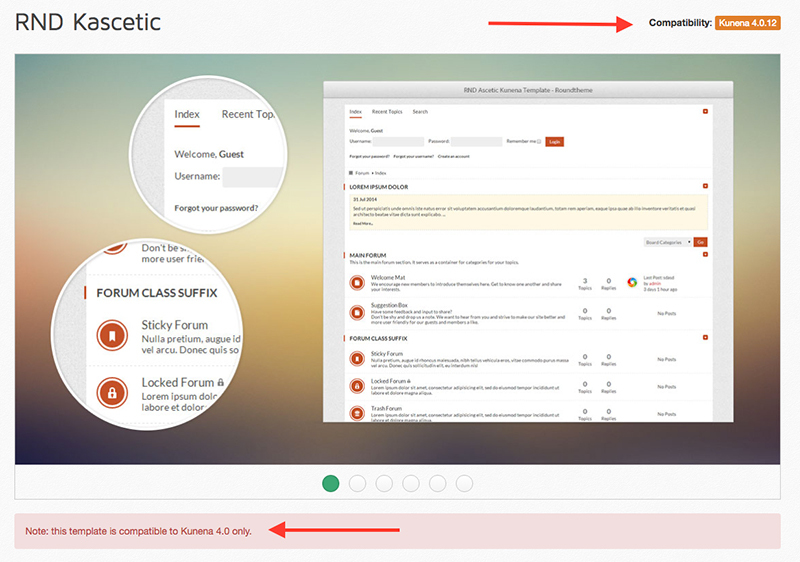 We are sorry, but there is no version of RND Kascetic for Kunena 5. We are working on new series of templates to be released after a month. So, you can await when these template will be released and contact us which template will be chosen (your subscription will be renewed) or confirm a refund and soon you can buy the preferable template again. It's your choice. Which way you would prefer? As concerning the second question: your user account is active. Can you sign in to Roundtheme site now under your credentials? If no, please let me know. Last edit: 1 year 10 months ago by Eugene S..
merci pour votre retour, je souhaite être remboursé pourriez vous m'indiquez la marche a suivre ?, je passerai voir vos nouveaux modèles de template avec interêt merci. Thank you for your return, I wish to be refunded could you indicate to me the procedure to follow? I will pass to see your new models of template with interest thank you. 1 year 10 months ago	#503 by Eugene S.
The refund just been made. Your refund should appear on your credit card/bank statement within the next 7-10 days.